If you had any reservations that freedom of speech in the United States is a quaint concept that has been sacrificed on the altar of political correctness and expediency, it’s time to abandon all hope. A series of separate incidences in the Sunshine and Lone Star states clearly illustrate that the freedom to voice one’s opinion, as memorialized in the U.S. Constitution as well as these state’s constitutions, may be an endangered relic of bygone days. The private pool is in a majority-white neighborhood in McKinney, which was ranked No. 1 by Money magazine as “Best Places to Live 2014.” The city, about 30 miles northeast of Dallas with a population of around 155,000 and a median family income of nearly $100,000, was “the nation’s fastest growing city from 2000 to 2003 and again in 2006, among cities with more than 50,000 people.” Not exactly your average hotbed of racial tension, real or imagined. There was no mention of our cherished right to free speech enshrined in our founding documents by the elite media, nor were there any calls to step back, take a deep breath, and reassess the matter. He was gone in a flash, his right to free expression trampled, his life forever altered, and all of us worse for the wear after this and all the other assaults on our most basic right. Ms. Fitzgibbons was obviously unaware that the First Amendment was disregarded when she apologized and tried to use reason to keep her job. “It was not an educational post; it was a personal experience post,” she told a local paper. Those familiar with the U.S. Constitution and the Bill of Rights are correct to state that these documents only apply to the federal government, but what about the individual state constitutions? So since we’re a “Bible thumper website” who “reject[s] Yiddish authors” and “censor[s] these words,” and “a Nazi website,” whatever that is, then I guess there would be no reason for you to post comments here anymore. So sad, because your comments were chock-full of valuable information. Sh*t, Pi*s, Cu*t are words needed to add expression to articles. Only Bible thumper websites or those that reject Yiddish authors would censor these words. 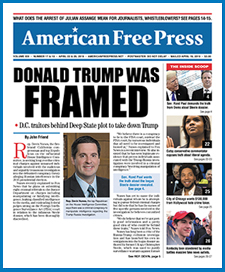 If they are censored this is not American Free Press but a Nazi website. All comments containing obscenities will be amended and posted, unless they are too obscene and nonsensical, in which case they will be deleted. Who is the moderator that has researched Google and decided that my posts are too obscene or controversial to post? This a Christian anti-Semitic website, not free press. Websites must not moderate comments or delete members for obscene or unwanted posts. This is the new censorship. All posts must be allowed to appear. Well, I have very short but loaded comment.